Going through my morning routine, I stumbled across a BBC Article that said that we've got a Substantial El Nino event happening right now. It was originally announced in March that it was a weak El Nino but apparently it's been upgraded. The Australians have been watching since their normally dry climate there gets drier. The assumption there being that you'll want to watch for more brush fires. Since I'm not a weatherman, or a meteorologist, I decided to dig in and see what I could find. That led me onto a long search on the subject of what does that mean to me here in South Florida. 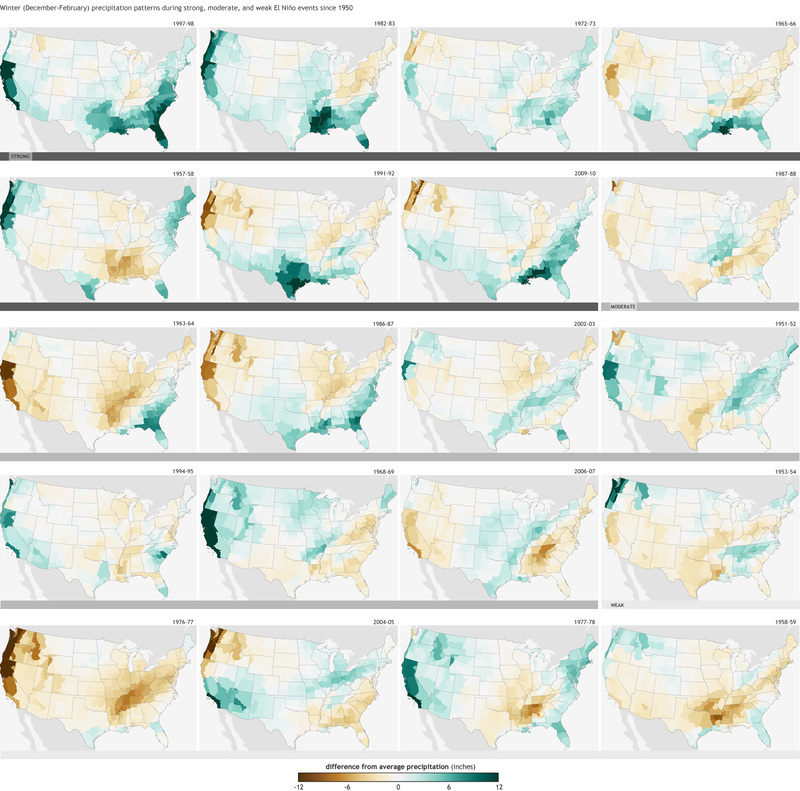 Wetter than normal, fewer hurricanes in the Atlantic than normal in the summer. If that is the case, that means we won't have any water worries for a while here because Lake O will refill (isn't it high already?) and the aquifers will recharge. The pages that I came across were all about general trend and so forth and a discussion of how it all comes to pass. Something shuts down the tradewinds that normally push water across the Pacific towards Australia and Indonesia. The resulting wave allows the water to relax and flow back towards Ecuador and Peru. Since that water is from a hot part of the world, the Australian water will warm up Ecuador and Peru when it gets there causing droughts and less productive fisheries. The maps are general, and usually show "trends" with blobs all over the place to indicate the broad probabilities. This NOAA map is typical, and shows the Summer. That is what this video shows. A nice concise description from Climate Central of the mechanics of the El Nino effect. There are world wide consequences, mostly focused in the middle and central latitudes in a big thick band. Above roughly latitude 40N (Philadelphia, PA) the effects lessen. However, if you're a ski fanatic, book your trips to the Western Resorts since the weather is expected to be, generally, wetter than normal. They need that there, but the Southwest, West, and South will be wetter, just like here. Wetter winters can mean more snow and some more blizzards than usual. Perhaps too much because we'll be hearing about flooding where there were droughts earlier. That Wet And Cool implies either ice storms or blizzards in the Interior South of the US. Again, that probability thing. 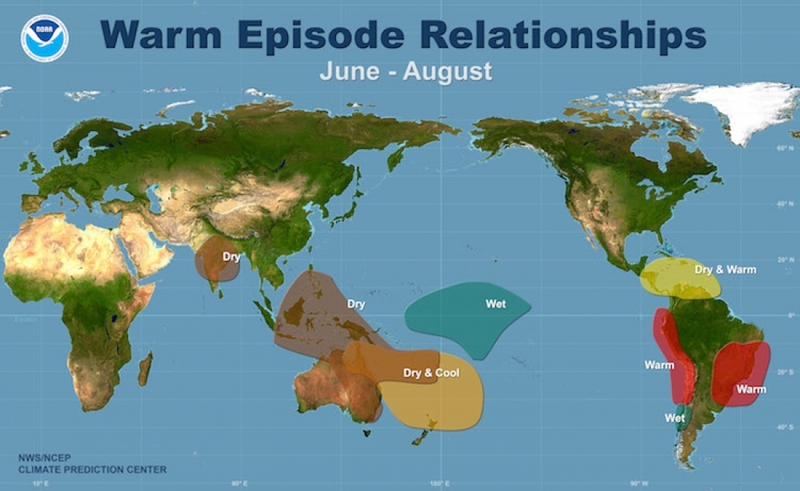 Since the weather is such a complex system, the idea that one El Nino will be just like the rest. Looking back at the last 60 years, and categorizing the events by strength, the stronger events had a significant amount of variance between them. The rain patterns are not set in stone and there aren't "Rules" but trends. The best thing to do is to say Weather Will Happen, and Be Prepared since you can't change it. But for me, the takeaway is fewer hurricanes in Florida. I've been wondering about that. I still have Hurricane Food from last year to be eaten!